If you’ve been keeping up with the latest contractor and consultancy news you’ve probably noticed that the hot topic of conversation at the moment is IR35 and the recent public sector changes. But what is IR35? This guide will look at IR35 in detail and try to clear up some of the complexities. As a contractor, freelancer or small business, it’s important to have an awareness and understanding of IR35 to ensure that you are paying the correct amount of tax and National Insurance. It’s a complex subject and it can be difficult to self-assess your status under IR35 rules. Over the next few weeks, we’ll be analysing IR35, breaking down the complicated subject into easy to understand and manageable pieces and taking a look at how it’s likely to impact the future of independent professionals. Be sure to keep an eye on our blog and twitter feed for regular updates. Currently, in the contracting world, IR35 is talked about in panic-stricken voices. You’ll often see headlines like ‘is this the death of the contracting industry’? Well, we certainly don’t think it is. Take a look at the inniAccounts breakdown of how IR35 is likely to impact independent professionals here. IR35 is an initiative designed to combat tax dodging. More specifically, it was HMRC’s response to a growing number of employees leaving their permanent roles, setting up their own businesses and then returning to perform their old role as a contractor. Thus avoiding paying tax and National Insurance at higher rates. IR35, or the Intermediaries Legislation, is a group of legislation within the Social Security Contributions (Intermediaries) Regulations 2000 and the Finance Act in 2000 (Schedule 12). It aims to ensure contractors working as ‘disguised employees’ and their employers pay the same level of tax and National Insurance as employees. Put simply, your IR35 status (which can vary from contract to contract) determines your tax position with HMRC. It’s important to understand the definition and your personal risk of being defined as a ‘disguised employee’ for each contract you undertake. IR35 runs across every business sector and specialism. One of the new changes, that you’ve probably heard about, is change to how IR35 is applied in the public sector. This has significant implications for independent professionals working for a public sector organisation. The ‘public sector’ is defined by the Freedom of Information Act (2000), it includes broadly any government body such as a local council, the NHS, Ministry of Defence, the BBC, higher education institutes, fire services as well as many, many others. As of April 2017, the requirement for effectively applying PAYE and National Insurance Contributions (NICs) will pass from the independent professional to the public sector engager or sourcing agency. Public bodies will now need to decide if they are engaging a contractor that is legitimately self-employed or whether they should be subject to PAYE and NICs like any other employee. The rules used to determine if IR35 applies to a contract remain unchanged. With public bodies now being responsible for this call, decisions on IR35 are more likely to be risk averse. Meaning many contractors will be brought inside IR35, which will likely impact their tax bills and status. In the private sector, however, independent professionals remain responsible for deciding if IR35 applies to the contract with their employer. Contractors and consultants are responsible for paying the correct levels of tax and National Insurance. There are a lot of factors that are assessed to determine whether you are operating outside IR35 (as a truly self-employed contractor) or inside IR35 (as a disguised employee) and it can vary from contract to contract. Find out more about how you can determine your IR35 status here. HMRC have also introduced an Employment Status Service (ESS) tool (please be aware that there is some controversy surrounding the shortcomings of this tool, we’ll be discussing this in further detail over the next few weeks). This service can be used to find out if you should be classed as employed or self-employed for tax purposes. You can also use HMRC’s Contract Review Service. Should I avoid IR35 contracts? Not necessarily. There is nothing wrong with operating inside IR35 so long as you pay the correct levels of tax and NI. With inniAccounts, it’s easy to manage any contracts you have both inside and outside of IR35. You can read more about managing IR35 contracts with inniAccounts here. Remember, the influence you have when negotiating contracts is not just about your rate, but also the contractual terms. If you are offered a contract deemed by the end client to be inside IR35, or you are unsure of your contract status, continue to seek professional advice from experts in IR35 such as The Law Place. This will help prevent being falsely identified as an employee, and they can help identify alternative terms to remain outside the legislation. You can read more in our IR35 guide. It is inevitable that some contracts will be inside IR35. 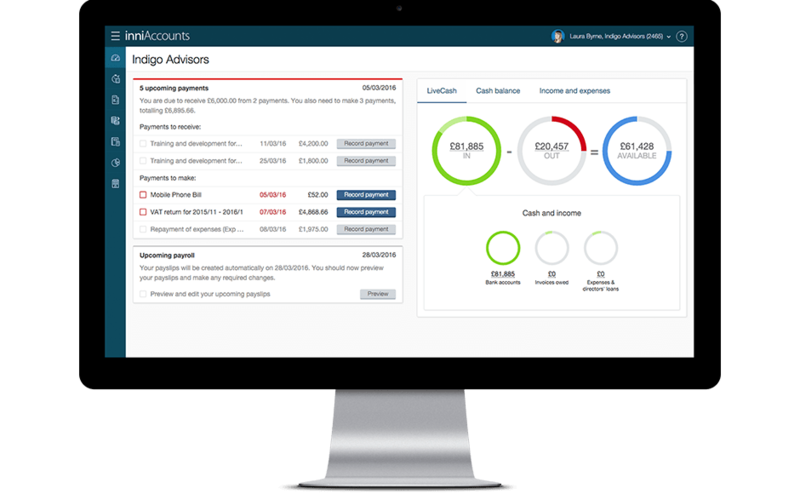 Should you be in a position where one of yours is, features built into our software to support IR35 make running your business and getting paid even easier. As with all dealings with regulatory and financial bodies, great record keeping and scrupulous collection of evidence is the best way to ensure that should your status come under scrutiny; you’ll have everything at your fingertips.